BIO: After ending his professional football career with the Ohio Glory in 1994, Bishop Slade became a professional bodyguard with extensive training in the field. In 1997, he began doing bodyguard for a very famous family in professional wrestling in Oahu, Hawaii. They convinced him to train to become a professional wrestler. In late 2001, Bishop Slade suffered a broken foot while wrestling, and is now looking forward to picking up the pace where he left off." 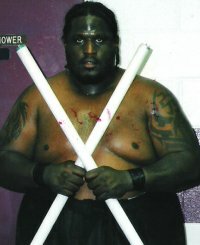 Bishop Slade has since been a staple of Ohio Valley independent wrestling and wrestling regularly for XWF Inc.. Bishop has had a longstanding feud with Storm Trooper, creating some extremely violent matches in the process.